Quality Vision International (QVI) of Rochester, N.Y., is a global leader of metrology solutions. Its brands include OGP, VIEW Micro-Metrology, Quality Vision Services, RAM Optical Instrumentation and Certified Comparator Products. The company’s diverse product range covers a wide spectrum of industries. While it has a selection of 50 standard-model machines, QVI is also capable of engineering high-accuracy metrology solutions that are ideal for specific customer applications. With the purpose of the company focused on accuracy, QVI settles for nothing less and it expects the parts it manufactures to be of the highest quality. It needed reliable precision machining processes that would keep measurement capabilities ahead of the trends. In fact, QVI’s products have tight tolerances and must be more accurate than what its customers are measuring. 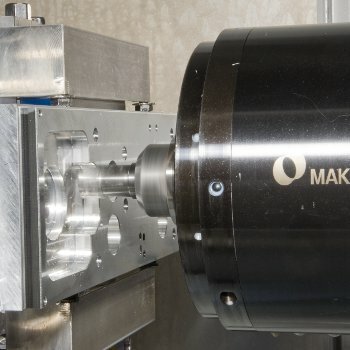 Its current machine tools were not meeting manufacturing requirements, so QVI sought high-performance machining capabilities that matched the performance it expected from its own machines. This expectation required a larger work envelope that did not sacrifice quality. QVI purchased a Makino a61 horizontal machining center. The machine column design provides strong support through the Y- and Z-axes, and it offers high accuracy. Two years later, after experiencing success with the a61, QVI purchased a Makino a81 horizontal machining center to help expand its capabilities. To further reduce cycle times and retain the highest accuracy, QVI also purchased a multisided fixturing vise that would enable the a81 to machine all six sides in a single setup on one of its more precise measurement products. The a61 exceeds all tolerance requirements and is even used to machine prismatic components with tolerances that require single setup machining to eliminate stack-up error. The a61 machine’s rotary table provides the sub-micron positioning accuracies without extra equipment, and maintains these tolerances even after extended periods of service. The increased machine reliability that the a61 provides has been key to the fast production of precision parts—with cycle times that have been cut in half. With the a81 machine, the roughing time for one of the parts that QVI machines has been reduced by almost 70 percent, while still achieving the required 5-micron high-accuracy tolerances. On the part for which QVI had purchased a multisided fixturing vise, there have been increased accuracies and reduced finishing times that sped up production, enabling QVI to achieve a much faster than expected ROI on the a81.